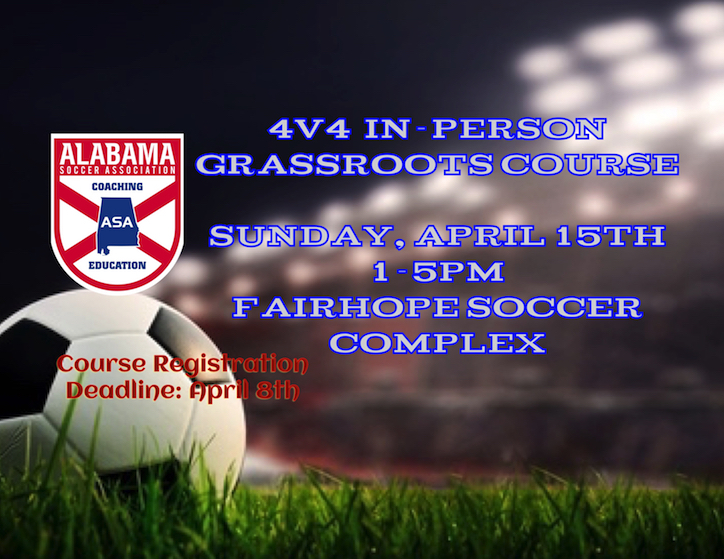 Fairhope Soccer Club will be hosting Kevin Laux, ASA Technical Director & the In-Person 4v4 Coaching Course. Being members of Alabama Soccer Association, coaching education courses are available to us. We highly encourage our coaches to sign-up. Registration Deadline: April 8th Cost is $45 for ASA members. 4V4 IN-PERSON COURSE is a four-hour course that builds on the principles covered in U.S. Soccer’s Introduction to Grassroots Coaching Module. Specifically, candidates will learn more about U.S. Soccer’s Grassroots Coaching Education Philosophy, Play-Practice-Play Methodology, the Six Tasks of a Coach, and the characteristics of players aged 6-8. The course will also ask each candidate to reflect on their experiences to develop action steps for personal growth.